Stone top layer is glued on aluminum backer. Polished. You may order custom surface treatment - honed or acid washed for an additional charge. For outdoor applications or commercial areas we recommend to order solid marble medallions 16-18mm (~3/4") thickness without aluminum backing. Instead solid marble is backed with plastic mesh net. Medallions over 36" diameter shipped as several segments. Segments are fit on-site without gaps. Additional charges apply. Select 3/4" option in thickness when ordering on-line. All stone medallions by Czar Floors are made by cutting natural stone slabs with a CNC high-power waterjet. Compare to other manufacturers such as "Medallion Depot" or others. Buried in their descriptions is the fact that their medallions are made from inexpensive off-the-shelf 12 x 12 x 3/8 marble tiles. Our process eliminates visible seams between various marble pieces and simplifies handling and installation. No puzzles to assemble. 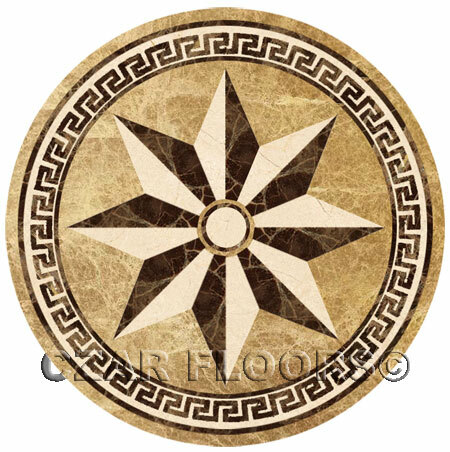 Medallions up to 72" in diameter can be made as a single piece, ready to install. Larger marble medallions are supplied as precisely fit segments. Waterjet medallions in standard 3/8" thickness are assembled as tightly as possible on aluminum backer. Czar Floors medallions are polished and sealed and there are no gaps or grout between individual pieces. The key to make a large single medallion piece is to use modern technology to fuse marble top layer to the ultra-light and strong aluminum honeycomb backer. Thickness refers to an overall combination of marble and aluminum. Review STONE MEDALLIONS INSTALLATION INSTRUCTIONS. Natural stone is a product of nature and varies in color, veining, and shading from slab to slab. Consequently, the natural stone product images you see on this website will vary from the actual product we create.